Break Speck up into small Nickle-size pieces and set aside. Slice Plum Tomato and set aside. Grate Asiago and set aside. 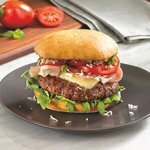 Cook your Burger to order (4-5 minutes per side on high heat will usually yield a medium rare Burger). When your Burger is almost done cooking, slice of Fontina cheese on top and allow to melt. Use the Quick Steam Method for a faster melt. 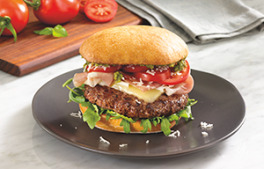 Build Your Burger: Bottom Bun, Arugula, Burger, Speck, Plum Tomatoes, Asiago, Pesto, Top Bun.